World-renowned artist Kerby Rosanes specializes in black ink doodles and sketches, and at the age of 23, he quit his desk job as a graphic designer to pursue his art full time. With a legion of over a million followers, Kerby has been a source of inspiration to artists, designers, and art-lovers all over the world with his stunning art and inspirational messages like "Never Quit Drawing" and "Be Awesome Today." 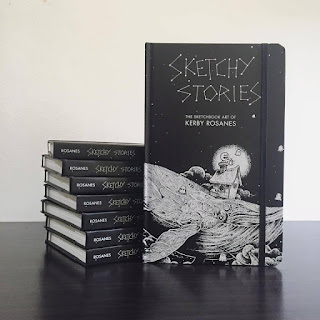 Now fans can glimpse the personal sketchbook of Kerby Rosanes with Sketchy Stories, a beautiful facsimile reproduction of his original sketchbook, loaded with secret doodles, elaborate sketches, and whimsical lines and detailed patterns. Interspersed with his artwork, Kerby also includes techniques, tips, inspirations, influences, and more. The ideal gift for fans of Kerby Rosanes or anyone who is ready to be creatively inspired. Kerby Rosanes doodles like Picasso paints. Most of us doodle faces, lines, circles or hearts. Kerby doodles incredibly detailed masterpieces. This book is a replica of some of his finest pieces. The book is made to look like a sketchbook which opens flat so you can see most of the drawings on their two page spread. My daughter loves to draw and found this book interesting and inspirational. His drawings are a touch of whimsical with tons of animals, faces and places. Using mostly black ink and the use of light and dark shading Kerby creates masterpieces that make you want to look at them over and over again because you always spot something new hidden that you never noticed before. That surely is interesting book.